Dec 19 - Low Emission Zone - Just Add CCS! Nov 16 - CCS Can Support Renewables! In context of strengthening the global response to the threat of climate change, IPCC released it's 1.5 Degree Celcius Report on Oct 8, 2018. As VP of Strategy and Stakeholder Relations, Beth leads the Knowledge Centre’s considerations of policies and regulations that foster CCS; and focuses on helping to link CCS knowledge with other countries to reduce locked-in investments and collaboratively support the goals of the Paris Agreement. Her understanding of complex climate change matters, capacity building requirements, and international financing concerns act as a solid basis for assisting both national and international implementation strategies for technologies that support environmental targets. Prior to joining the Knowledge Centre Beth worked briefly as legal counsel for the provincial Crown utility. She pairs this industrial perspective with regulatory knowledge as Acting Director of Climate Change with the Government of Saskatchewan. These positions are reflective of Beth’s time with the National Round Table on the Environment and the Economy where she focused on analysing provincial/territorial climate action plans and making recommendations for low cost and sustainable pathways. Beth’s legal education, teaching and practice have explored balancing energy, the environment and social implications. Last weekend, the Intergovernmental Panel on Climate Change (IPCC) released the report Global Warming of 1.5 °C an IPCC special report on the impacts of global warming of 1.5 °C above pre-industrial levels and related global greenhouse gas emission pathways, in the context of strengthening the global response to the threat of climate change, sustainable development, and efforts to eradicate poverty. This report was compiled by 91 authors and review editors from 40 countries in response to an invitation from the United Nations Framework Convention on Climate Change (UNFCCC) when it adopted the Paris Agreement in 2015. 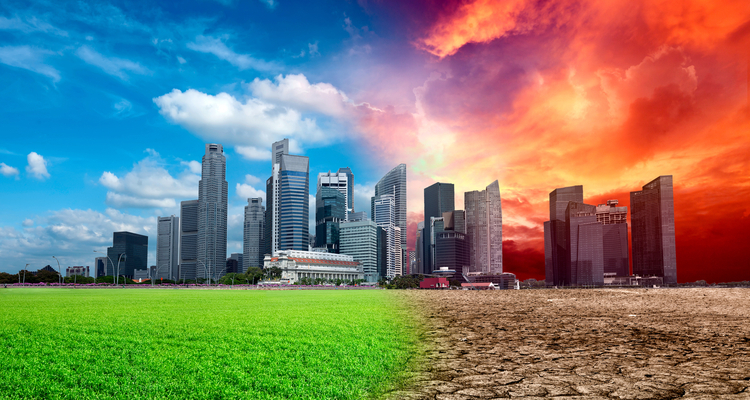 The report highlights several climate change impacts that could be avoided by limiting global warming to 1.5ºC compared to 2ºC or more including global sea level rise, melting Arctic Ocean sea ice, and coral reef decline. There are four main pathway scenarios that are repeatedly referenced through the report which show the breadth of variation that can occur for net global CO2 emissions. For the International CCS Knowledge Centre the pathways support what we already know – carbon capture and storage (CCS) is necessary in almost all scenarios to mitigate climate change. Further, as was seen in IPCC’s AR5 Report removing CCS from the portfolio of available options significantly raises mitigation costs. Three of the four pathways include CCS as well as bioenergy CCS (BECCS) as mitigation options. Pathway #1 looks at a scenario of rapid down-sizing in the global energy demand accelerating the decarbonization of the energy supply system, matched by a rapid increase in renewable energy along with application of afforestation. In Pathway #2, the scenario offers a broad focus on sustainability with down-sizing in consumption patterns, including energy as well as the inclusion of low-carbon technology and the use of CCS and BECCS. Pathway #3 is referred to a ‘middle of the road’ scenario which sees the continuation of historical social and economic trends with emissions reductions coming from new methods to produce energy rather than a down-sizing in demand. This scenario requires an active and expansive use of CCS and BECCS. In Pathway #4, the scenario envisions global consumption, at current day levels, with a growth in demand for high-energy products, such as air travel and meat. Emission reductions are mainly achieved through a broad use of CCS and BECCS. With this scenario there is considered a high chance of overshooting the 1.5ºC before leveling-off in the later part of the century. Each of the scenarios would require concerted effort globally, whether it is through commitments in policies and regulations to drive down both energy demand/supply and consumption or mitigate impact of growth through a combination of efforts that would also include low energy technologies and CCS. The remainder of this blog focuses on the role of CCS in mitigating to 1.5ºC rather than BECCS or the lesser discussed direct air capture or utilization of CO2 into products - the latter having negligible impact on climate mitigation. (See article: CO2 utilization could prove to be a fateful sidetrack in the climate mitigation debate). In several of the IPCC pathways, CCS is required to reach 1.5°C. However, the report also recognizes the challenges for CCS, namely: 1) the limited pace of current deployment, 2) the evolution of CCS technology associated with deployment, and 3) the lack of incentives for large-scale implementation of CCS. The report attributes the slow pace of CCS to institutional, economic, technical, and financial limitations. Policies to incent CCS are needed to impact its business case and economic feasibility – especially in trade-sensitive industrial sectors. And yet while energy efficiency in industry is viewed as more “economically feasible” it is not consistent with reaching 1.5°C. The report further indicates that large-scale deployment of CCS as an option depends on the further deployment of the technology in the near term. The use of CCS on fossil fuels and industrial CCS play a significant part in mitigation pathways. The IPCC report references studies that have highlighted the importance of CCS based on its multiple roles to limit fossil-fuel emissions in electricity generation, liquids production, and industry applications. In the pathway scenarios that do not incorporate low energy demand, CCS importance remains valid for 1.5°C and 2°C. When there is very low fossil-fuel use overall there is, understandably, no ability to apply CCS to fossil fuels. CCS combined with fossil-fuel use remains limited in some 1.5°C pathways because CCS is penalized during incomplete capture rates and when fossil fuels continue to have significant lifecycle GHG emissions. The report does recognize that higher capture rates are technically feasible and that efforts continue to focus on cost reduction of capture. When it comes to the electricity sector, the IPCC’s pathways to 1.5°C shows electricity will increase (up to 71%) to 2050 but will also have a rapid decline in the carbon intensity of electricity (up to -92gCO2). The report acknowledges that in many sectors around the world, energy systems transition for limiting global warming to 1.5ºC are underway – with improvements in solar and wind energy as well as electrical storage technologies. Interestingly, the same political and economic support has not been provided to either nuclear energy or CCS and these two areas have not shown similar-level of improvements. When it comes to CCS specifically in the electricity sector, growth can occur in the share of energy derived from low carbon-emitting sources (including renewables, nuclear, and fossil fuel with CCS); allowing for a decline in the use of fossil fuels without CCS; and a growth in the use of CCS, such as abated coal. To meet stringent climate target scenarios, we would see the early retirement of carbon-intensive infrastructure and to reach ambitious emission reduction targets, by 2050, without CCS the share of primary energy from coal decreases significantly and is even irradiated. Alternatively, coal with CCS can see a longer lifetime. It would eventually be the same fate for natural gas – usage with decline – though pathways that show an increase in natural gas power do so only with widespread deployment of CCS. In fact, there is greater natural gas power with CCS than coal power with CCS in the range of the Report’s pathways. Again, the report supports the view of the Knowledge Centre that CCS in the power sector is not being realized at scale, due to several factors including costs of capture and transportation as well as appropriate market compensation or government incentives. It draws attention to the fact that there can be some cost recovery from enhanced oil recovery, but there is the caution in the report that there will be additional CO2 emissions by combusting the additionally recovered oil. However, there is no doubt that CCS, in the power sector, can contribute to cost-effective achievement of emission reduction requirements for limiting warming to 1.5°C. Notable in the report is the emphasis on the role of CCS in the industrial sector. Consuming about one third of the global energy, industry is also known to contribute one third of global GHG emissions, directly or indirectly. Baseline scenarios in the report, show the industrial sector increasing their energy demand to more than 40% between 2010 and 2050. Echoing the IEA’s Energy Technology Perspectives 2017 report, in a beyond 2°C scenario, CCS would have to contribute 37% to emission reductions from industrial sources by 2050. In context of 1.5ºC and 2ºC scenarios, CCS has a key role to play in decarbonizing the industrial sector, particularly in industries with higher process emissions, such as cement, iron and steel. And in line with our understanding, the report underscores that for some industries emitting CO2 is inherent in their process and without the use of CCS, they cannot achieve emission reductions to zero. As the report highlights, CCS is generally considered more feasible in the industrial sector than the power sector however also has similar challenges. Which is why it is important for industry-based CCS to have early scale-up to create both necessary project long-lead times and technological innovation. As recognized in this most recent report, in a 1.5ºC pathway, the storage capacity, over the century, of all of these global estimates is larger than the cumulative CO2 stored via CCS. According to an University of Edinburgh study, Fossil Fuels in a Trillion Tonne World, there is closer to 10,000 GtCO2 able to be permanently stored. With a renewed urgency for action on climate change and with CCS identified in the majority of IPCC’s pathway scenarios to get to 1.5ºC, an intentional and tactical approach is needed for commercial scale CCS. From a global perspective, reliable energy and active industry are incumbent for developing countries with growing middle classes. Implementation of CCS could support a maintenance in existing generating assets while at the same time meaningfully aid in decarbonizing electrical grids and other industrial emissions.